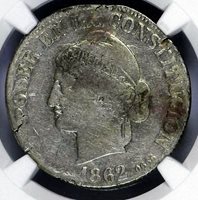 ***** NGC ***** ECUADOR 4 REALES 1862 1 YEAR TYPE! F-12 LOOKS BETTER! RARE! 1944 Ecuador Crown Size Silver Coin Five Sucres Mint Mark Mo Mexico City Unc.